Gaza, March 27, Mohammed Al-Helo, a four-month-old infant, died when the shortage of electricity in the Gaza Strip caused the artificial respirator his life depended on to shut down. His death was a personal tragedy for his family, but for Hamas – the Islamic movement that governs the Gaza Strip – it was an opportunity to illustrate how difficult its struggle is to keep its citizens safe and secure. Portraying it as the first recorded death due to the energy crisis, the movement’s spokesmen and the family said Mohammed’s lifeless body had been brought to Shifa Hospital last Friday. As the Associated Press quickly discovered, however, Mohammed had in fact died March 4, nearly three weeks earlier. But the battle goes on unabated to assign the blame for weeks of chronic blackouts, long lines at filling stations and rising unemployment that have caused ordinary Gazans to move from distress to anger. The sides are arrayed like this: Hamas blames Egypt for the fuel shortage, as well as at various times Israel, Fatah and the local power company. Egypt blames Hamas. Fatah blames Hamas. The local power company blames Hamas, too. Even Islamic Jihad entered the blame game. But it can’t decide who is responsible. If the finger-pointing goes in every conceivable direction, no one takes issues with the fact that Gaza’s 1.4 million people are suffering. 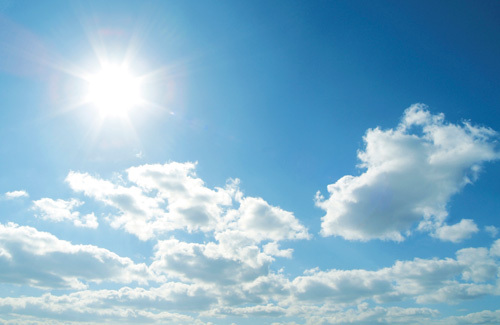 Scheduled power cuts aimed at saving limited supplies of fuel have grown to between 12 and 18 hours a day. Ambulances and fire trucks have put 60% of their fleets out of service. Bakeries have cut back working hours to the mornings. Hospitals are on an emergency footing. Farmers have destroyed crops due to the lack of refrigeration. Finding a cab is a mission impossible, which means students often fail to show up for classes and employees at their workplaces. Hamas has tried to absorb the rising anger by offering to chauffeur students in governmental-owned vehicles. But the great majority of Gazans aren’t sharing in the humor and increasingly daring postings are calling on Hamas to step down. A survey conducted earlier this month by the Palestinian Center for Policy and Survey Research (PSR) found that Hamas could capture just 27% of the vote if parliamentary elections were held today, a decline of eight percentage points from three months ago. Satisfaction with the Hamas government was down five percentage points to 36%. “Yes, we elected Hamas for government in Gaza back in 2005. They should rise up to the occasion or just resign or leave or announce their failure,” Hussam Hamidiya said. A sharp drop in power supplies last week has given new impetus to the blame game. Electricity was rationed to a mere four hours day, at most, which idled pumps and led to a shortage in water. Hassan Younis, the Egyptian minister of energy and electricity, had this to say about where the onus for the blackouts lies – and it is Hamas. Cairo is prepared to supply fuel at low cost to Gaza in consideration of the hardships of life there, he said, but it wants the supplies to be shipped in an orderly fashion, though Israel’s Kerem Shalom crossing. Instead, said Younis, Hamas wants to rip off Egyptian taxpayers by buying energy that is subsided by the Egyptian government for its own people and smuggle it through the network of tunnels running under their joint border. Hamas wants to rip off Gazans by demanding the fuel be shipped through the Egypt-Gaza border terminal at Rafah, where it can collect taxes on the imports. Egypt, he said, would have none of it. Taher El-Nono, the Hamas government spokesperson, fired back by accusing Egypt of cooperating with the Israeli occupation. “The Gaza fuel shortage crisis was cooked by many parties and we blame the Israeli occupation for imposing a suffocating siege on Gaza,” he said. “We signed many agreements regarding electricity and fuel with Egypt but they didn’t commit to their obligations despite our transfer of $2 million for fuel.” The Egyptian Energy Authority answered back that Hamas still owes it $6 million. Not satisfied with blaming Egypt and Israel for the crisis, Hamas official Mahmoud Al-Zahara issued a press release accusing Gaza’s Electricity Generating & Distributing Company for the problem. The company didn’t take that lying down. Acting General Manager Walid Sayel issued his own press release: “The company lacks only fuel, and the fuel is the responsibility of Gaza’s Energy Authority, which is run by Hamas.” He accused the Hamas government of trying to seize control the company’s finances, which are now monitored by the Fatah-controlled Palestinian Authority. Fatah, meanwhile, let loose with a volley of accusations against Hamas. 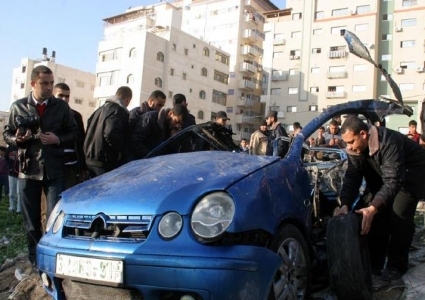 Its regional office in Gaza issued a press statement denying any responsibility for the fuel crisis or that it was exploiting it to inflame public opinion against Hamas. When two small shipments of fuel did make their way to Gaza over the weekend from Israel and from Egypt, Fatah and Hamas both crowed over their role in arranging it, making sure that each side’s leaders featured prominent in taking credit. “After extensive efforts done by President Mahmoud Abbas, Salam Fayyad, and Hussein al-Sheikh along with Egyptian officials in negotiating with the Israeli side, which were successful, large quantities of industrial diesel this morning were pumped for the Gaza’s only power plant,” announced Nathmi Muhana, chairman of the PA’s Crossings and Border Authority. By Sunday, however, the Gaza Energy Authority announced that the plant would shut down again after the industrial diesel supplies were used up. Gazans are disappointed by this "power" struggle and endless battles between Palestinian factions. They wonder when all of this will end? and if it will ever end? 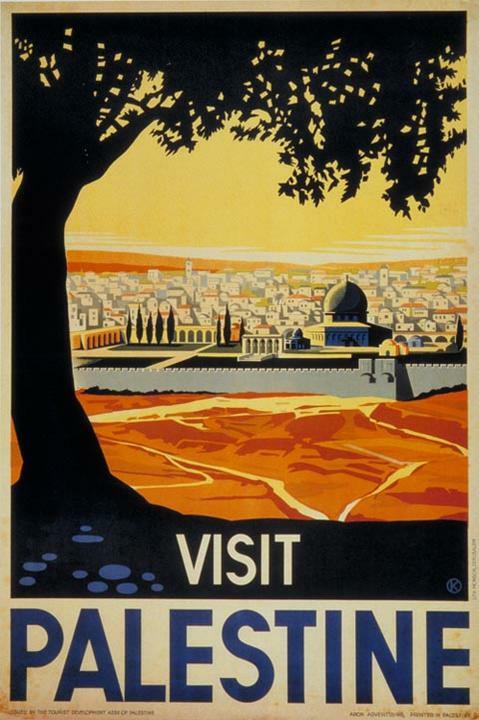 "Visit Palestine" poster by Franz Kraus - what does it stand for? Gaza, March 20, I came across this “Visit Palestine” poster somewhere and I stopped to admire my homeland’s beauty. Honestly, the portrait is beautiful. The past two years have been a sole proof that when “its too good to be true, then its probably NOT true”. I took a closer look. I spotted writings in Hebrew and the name of the artist behind it. I was right. A quick note: This poster was made in 1936. When you take a first look, you would think Franz was a Pro-Palestinian Jew\Israeli. Think again. Yes, this portrait was done in 1936 (before the Palestinian Nakba, Foundation of Israel). Yet, Franz painted a wide range of similar portraits “celebrating” the beauty in Palestine and asking Jews everywhere to come and redeem their land. Yes, you read it well, redeem their land and yes “again” this was prior to the foundation of Israel. Some of Franz’s portraits had titles like: “Blessed Land of Israel Awaits Redemption”, “Redeem the Land”, “Zionist Pioneer - Krausz Draft”, “Yakhin Jaffa Oranges - Jordan Jaffa Oranges”, “Guide to New Palestine”, “Invest in Palestine - Build the Jewish State”, and “Eretz Israel - The Country of Our Future”. I don’t know what redemption Franz was talking about if all those portraits –those with redemption and Zionist titles- was made between 1935 and 1936. If Israel was founded in 1948, what land do they want to redeem exactly? Ok, I wont be turning to google or WikiPedia or different links to tell you about the history of Palestine. I am not a history teacher, nor do I have the intention of giving you a lecture in history. So, Palestine was Palestine until some Zionist Jews like Mr. Franz decided they wanted redemption. Redemption of a land that was never theirs, AGAIN Israel was founded in 1948. So Zionist Jews inside and outside of Palestine decided to expel Palestinians and take their land because they wanted redemption. Palestinians tried to fight against this ethnic cleansing but unlike Israel, we were not armed by the British occupation, so we lost. So who should ask for redemption? Prior to 1948, Israel didn’t exist, Palestine did, yet we have no right to claim that the land is ours???!!! Franz wanted Zionist Jews to come occupy Palestine and take everything, even the name of the country they will take by force. Instead, they came and took over but changed the name into Israel. Well, he did mention Eretz Israel as the country of their future in one of his portraits. He failed to mention that it will be built on the ruins of a country, ruins of a nation and on the ruins of Palestinian corps. Israel relied on “smuggled” Western, Soviet and Czech weapons to ethnically cleanse my people and my land. I give Israel A for repeating history in such a shockingly replicated way. They performed and still performing an on-going “holocaust” against Palestinians but we aren’t allowed to talk about it or we will be labeled as “anti-Semitic”. As if, Palestinians themselves aren’t Semites. They forced Gaza to rely on “smuggling” tunnels after imposing an unjust siege using the pretext of “Shalit”, an Israeli soldier who was released weeks ago, yet Gaza remains under SIEGE. Ok, ready to hear something hilarious? I came across another link related to “Visit Palestine” poster that was done by Franz Kraus. The article featured David Tartakover, sixty, the graphic artist behind the appearance — or reappearance — of this poster. David is an Israeli who won a top prize for design in 2002. He expressed his anger when he saw the same poster hung, painted and portrayed by Palestinians in the West Bank and East Jerusalem. He considered this as “Hijacking” the art of his fellow Zionist –We are talking about Franz Kraus here- and how Palestinians did it in a very cheap way. So an Israeli has the right to feel angry and accuse us of hijacking a poster that portrayed OUR land. Yet we CAN NOT ACCUSE Israel of hijacking our land, hijacking our culture and killing civilians. Hush, you are Palestinian. You were born to die with no voice or rights. Have you heard of this expression: “He believed his own lie”? I think it implies on Israelis. We differentiate between a Jew and a Zionist, but its not enough. We call for peace, but its not enough. We condemn the killing of Israeli children in local accidents, but that’s not enough. We condemn the death of Jewish children in international accidents, but its not enough. We shout loudly to explain that not all Gaza’s 1,800,000+ residents are militants, but they don’t believe us and its not enough. We swear that most of us are civilians, they don’t believe us and its not enough. Its never enough. Its our land, we are the victims yet WE ARE OBLIGED TO ALWAYS EXPLAIN OURSELVES. We are the occupied not the occupiers. Civilians are killed here while Israel claim self defense, feel free to check Israel statistics about the number of civilians killed by Palestinian “militants” each year and you will find a simple single digit if not 0. Yet, check the number of Palestinian children killed in Gaza by Israel, the number would be so damn high. You have to be really super dumb, brainless and idiotic to not see the truth. Gaza, March 13, This isn’t knew, I know but that doesn’t make it the norm and it shouldn’t be the norm in any way. 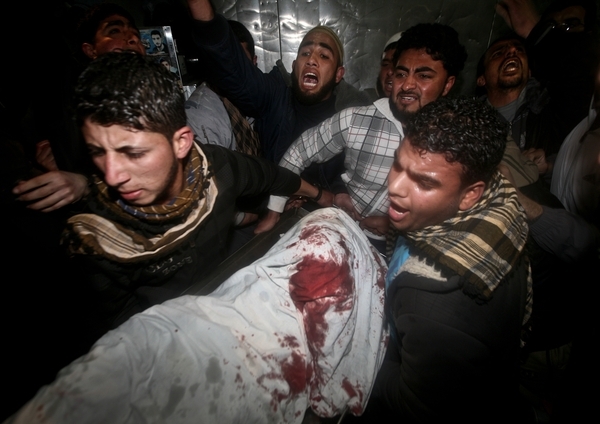 Gaza survived four continuous days of Israeli attacks that left 25 dead and 80+ injured. Among those injured, some are critical, some are children and some are women. Among those dead there were elderly, women and children. If you have a heart that enables you to claim that children, women and elderly should be killed because they live in Gaza which automatically means they are terrorists, I don’t consider you a human being. Children are children; I would never celebrate the death of Israeli child, ever. I am not here to report news, I am sure you already watch news channels every day. I am here to tell you a story, to show you that we are humans and not just numbers. Those 25 people who got killed during Israel’s latest vicious cycle of violence against Gaza have names, they are humans. One of them is somebody’s son, other one is somebody’s grandfather, and another one is somebody’s daughter. Saleh El Issi, 59, is a person that happened to be in the wrong place at the wrong time. Saleh worked as a watchman to a piece of land in central Gaza. Saleh is a civilian; he was targeted with two missiles from an Israeli drone that left him blown up into pieces. Saleh had a grandson, Mohamed, 6, who adore him. Mohamed was his grandpa’s favorite; he would take him for a shopping spree at the little local grocery store. Mohamed saw the drone moving and then saw two missiles falling nearby, his dad called his grandpa seconds ago to ask him to return back home because the area wasn’t safe. He was too late. Mohamed ran and saw his grandpa blown up into pieces; he is in a deep depression now. 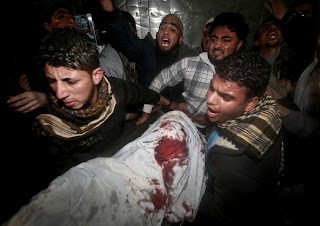 Nayef Qarmout, 14, died after an Israeli warplanes fired a missile near a gas station Northern Gaza, Nayef was walking with a group of his friends while on their way back home from school. Nayef’s friends got injured, but he didn’t make it. Mohamed Sa’d, his best friend, said that Nayef was a civilian and too young to think about joining any militant or resistance group. 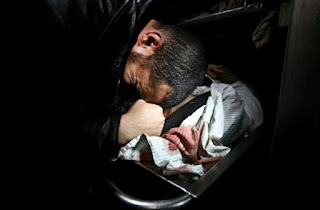 A father and daughter were also killed by an Israeli attack on Gaza. 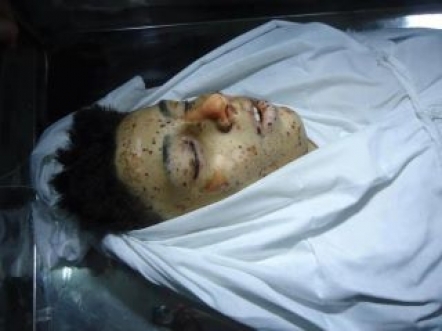 Ayoub Assaleyah, 17, he was also killed by an Israeli attack on Gaza. He was a civilian and his death left his mother devastated, she is in the hospital now after collapsing due to her little son’s death. 25 stories, 25 devastated families left behind, 80+ injured from which many are critical, homes wrecked, lives changed to the worse, children targeted, elderly targeted, women targeted and Gaza yet survives another dark period. Let me just remind you that Gaza remains under siege, darkness, lack of power, lack of fuel, lack of gas, lack of water and when you add Israeli attacks to that it immediately equals the bad memories of Israel’s war on Gaza back in 2008. I wonder when the world will see us as humans instead of just disposal “terrorists”? Why do we have struggle daily to grab just a little piece of normality, tranquility and some peace? Lets jump to Hana Shalabi, I will also tell you something personal about her instead of just stating a news report about her hunger strike that she started last February (16th) to object the illegal detention of her after her release last October as a part of Shalit swap deal. A quick note before I dive more into Hana Shalabi’s story, Israel has –reportedly- killed and re-imprisoned a number of those freed prisoners as a part of Shalit swap deal. Again, if you are ok with that, then you definitely need to see a doctor to locate a heart beat for you. Hana is one of nine children in a family of farmers in Burqin village, next to Jenin. On 29 September 2005, Hana’s brother Samer was killed by Israeli forces during an incursion in the village. He had been released from prison for only three months after spending nine months in prison when a group of soldiers came to their farm to re-arrest him and instead shot and killed him and his close friend. After being released from prison on 18 October, Hana planned to study nursing at Al-Rawda College in Nablus. As she was re-arrested less than four months later, she did not have time to enroll. 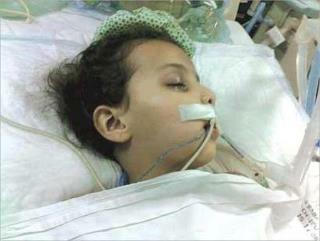 Ten days after Hana announced her hunger strike, her dad and mom started a hunger strike too. All three are suffering from a deteriorating health that gets worse every day; all three have their lives at risk just to stand against injustice and illegal detention. Please, go to google and learn more about Hana Shalabi. Decide, on your own, on how you want to help her. Either by telling her story, or signing a petition, or writing about her, and\or any other way you see fit. I will ask you to do your homework, decide the way and then research resources. You will become closer and more personal to Hana, instead of me directing you to links and ways. Gaza, March 11, Gaza remains under Israeli attacks for the second day in a row, while Islamic Jihad is still on “retaliation” mode. Another exchange of rockets that leads to 3 killed and many others injured in Gaza, a few injuries in Israeli settlements. Again, Israeli warplanes raided different areas in Gaza starting from Rafah in the south and ending by Beit Hanoun in the north. Israeli F16s raided a motorbike; Israeli Apaches raided a tuk-tuk, Israeli tanks shelled eastern Gaza, and Israeli armed boats opened random and sporadic fire across Gaza shore. Hussein Al Bureim, 51, and Mansour Abu Nasira, 21, and Mahdi Abu Shaweesh, 24. 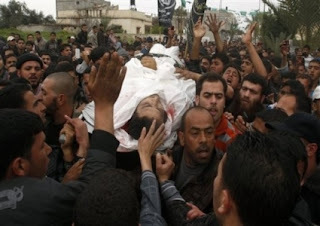 Medics announced the discovery of a new body in Zayton Neighborhood, Gaza, after an Israeli air strike on a free zone there. Ahmed Deeb Salem, 23, with that the death toll rises to 16 in two days and 33 others injured. 1- Schools closed for further notice due to security concerns. 3- Israelis and settlers rushed to the “secured” shelters\bunkers. 4- YouTube removed a video showing Islamic Jihad’s new rocket-launcher. 5- Israeli hackers tried to hack Gaza’s internet network. Ismail Haniyah, Prime Minister of Gaza’s De Facto government, released a very short statement to the press saying: “Haniyah is doing intensive calls with many parties to halt the Israeli attacks on Gaza”. On the other hand, Mahmoud Abbas, Head of the Palestinian Authority, requested the Palestinians to maintain truce\cease fire so as to not give Israel a reason to commit crimes. He held Israel accountable for its crimes against humanity in Gaza, he also accused Israel of destroying Gaza’s infrastructure. Israeli officials rushed to announce –in an indirect\official- way their will to cease fire if all parties can stick to it and to announce that they aren’t interested in any further escalation. They blamed Hamas for the latest Israeli attacks on Gaza and expressed their satisfaction behind the nature of the targeting in the last Israeli attacks on Gaza. Palestinian officials in Gaza blamed Israel for breaking the cease fire first by the first Israeli air strike on Friday that left 2 killed. They considered it a provocation and asked the world to hold Israel accountable for their massacres in Gaza and Palestine. Catherine Ashton, the European Union’s High Representative for Foreign Affairs and Security Policy, broke her silence by a very short statement released to the press, she said: “The European Union is following –with concern- the escalation of violence in Gaza and the Southern of Israel”. To top things off, Gaza’s Energy Authority, announced that Gaza’s only power plant will be shutting down –completely- today, for the 3rd time in a month, because of the lack of fuel. 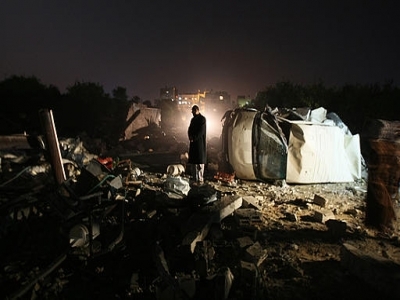 Gaza will sink under darkness again, but will be lit by the Israeli war machines. Can you imagine yourself living in such drier situation? Well, this is what citizens of Gaza have to live through. Palestinians in Gaza resorted to social media to get their voices heard and report what is happening in Gaza. However, the lack of electric power and the endless attempts of Israeli hackers to hack Gaza’s network left citizens of Gaza in a blackout. Gaza, March 10, Gaza witnessed a sleepless night after a continuous series of air-raids performed by Israel’s different warplanes (Apache, Drones, and F16s). It started on March 9, 5:00 pm, when Israeli warplanes targeted a blue car in a populated area. The blue Opel became a little box of steel, completely burned and blown into little shrapnel. 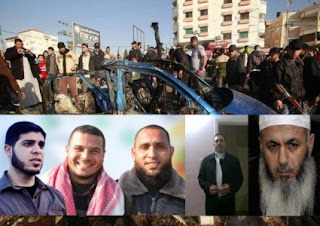 It happened in Tal Al Hawa, Western Gaza, and caused the death of Zuheir Qaisy, Secretary-General of the Popular Resistance Committees and Mahmoud Hanini, freed prisoner in Shalit swap deal, originally from Nablus. A third passer-by was critically injured. Later that night, 8:30 pm, March 9, medics announced the death of Khaled Harara, 22, and Obaid Al Gharabli, 23, both belong to Saraya Al Quds, armed wing of Islamic Jihad after being targeted by Israeli warplanes. Medics announced the discovery of a third body in the same place, Hazem Qureqe’. Israeli warplanes continued bombarding Gaza heavily till 2:30 am, March 10. No place in Gaza was safe, Israeli warplanes raided Eastern, Western, Northern and Southern Gaza, civilian houses, highly populated areas and highly trafficked crossroads. Shady Sieqali, Fayeq Sa’d, Mo’tasem Hajjaj, Ahmed Hajjaj, Mohamed Al Mughari and Mahmoud Nejem. Most martyrs were members of Saraya Al Quds, Islamic Jihad. Local resistance in Gaza retaliated and showered nearby Israeli settlements with homemade rockets. Some of the areas that were targeted by Israeli warplanes: Beit Lahyah, Shuja’yah, Sudaneyah, Maqousi Towers, Palestinian Legislative Council, Rimal Area, Tal Al Hawa, Yarmouk Street, Rafah, Khan Younis and other different areas. Israel and armed Palestinian factions in Gaza, all denied the news about a cease fire so escalation is in the air.